Now that you know the basics, let’s talk about each of these 5 products in more detail, and then I’ll go over a few more key features which make the Saranghae Complete 5 Step Bundle a top-shelf choice for skincare. First up is the Nourishing & Moisturizing Oil + Foam Cleanser. When you see the ingredients on this product, you will probably gawk. It contains ginseng, jojoba seed, apple amino acid, black truffle, and gold. You are literally putting the essence of luxury on your skin. Black truffle contains polyhydroxy sterol glycosides (GSG). These compounds reinforce the membranes of your skin cells. As to the gold, it might sound like a weird thing to put in a skincare product, but researchers at the Miami School of Medicine have discovered it can boost oxygen transport and fight inflammation. While putting out the fires of inflammation, this deep cleanser does an amazing job clearing out your pores. It also can improve overall immune function in your skin. Next, you will be applying the Deep Radiance Essence + Serum product, which contains Sang Hwang mushroom, carrot root, rosemary, Korean Pasque flower, and Comfrey flower. While each of these ingredients plays an important role, the star is undoubtedly the Sang Hwan mushroom. For more than 15,000 years, practitioners of traditional medicine throughout Asia have used this mushroom as an antidote to the effects of aging. Currently, it is also being studied for anti-carcinogenic properties. This product promotes “autophagy” in your skin. If you don’t know what that is, don’t worry — I didn’t have a clue either. Turns out that it is how your body dispels waste from your skin cells. The serum also improves skin pH and helps to heal your collagen and elastin. This can help fight wrinkles. Speaking of fighting wrinkles, the next step in the bundle is to apply the Firm & Lift Cellular Regeneration Cream. Along with Sang Hwang mushroom, this cream includes rosemary, ginseng, calendula flower, sunflower, and hyaluronic acid. This is a power anti-aging cream. According to the company, it can “reduce free radical formation by up to 220%”. Free radicals, of course, are intimately linked to the aging process, so reducing them dramatically in your skin can have an equally dramatic effect on its appearance. Additionally, this product can triple your elastin and collagen production. With its nourishing and moisturizing ingredients, it can reduce dryness, firm up loose skin, reduce wrinkles and age lines, and even make age spots and other areas of hyper-pigmentation less conspicuous. No skincare set would be complete without an eye cream! The eyes are where we look when we talk to someone, and if somebody’s eyes look puffy and tired, it makes their entire face look older. If eyes really are the windows to the soul, you want yours to look fresh and youthful. Ingredients in Focus Renewal Eye Cream include Sang Hwang mushroom, beet betaine, L-arginine, Korean Pasque flower, Comfrey flower, and adenosine. The natural ingredients make the cream gentle enough to use on the sensitive skin around your eyes. By boosting the essential fatty acid content in your skin, the cream hydrates and firms while combating inflammation and dark circles. 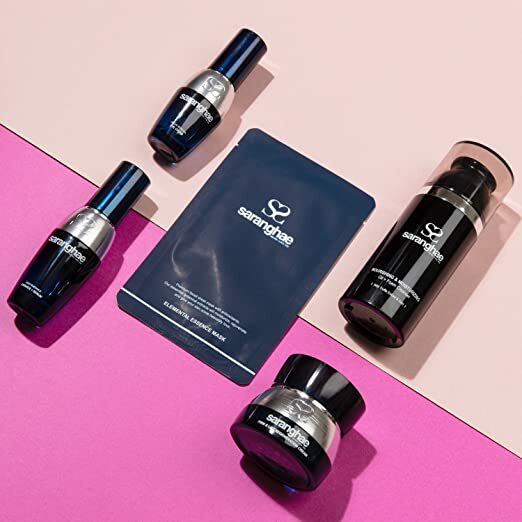 Finally, the Saranghae Elemental Essence Mask reinforces the effects of the other products in the kit while providing you with a relaxing, soothing experience. It contains CoQ10, hyaluronic acid, Imperial peony, Asiatic pennywort, and chamomile flower. These ingredients combine to further reduce free radicals, fight inflammation, and seal off skin cells from toxins. Now you know about the high-quality natural ingredients which make the Saranghae Complete 5 Step Bundle so powerful. But another thing I love about this product is that anyone can use it. It doesn’t matter if you are young or old, or anywhere in between — Saranghae can help you to capture the beauty and allure of youth and hold onto it. It doesn’t matter either whether your skin is oily or dry since Saranghae has a balancing effect. And even if you have sensitive skin which reacts to other products, you should find that Saranghae absorbs without causing irritation. Did I mention it also can help heal acne? One more thing which is awesome about Saranghae is that the company is true to its word about caring for the natural world. No animal ingredients are present in any of the products included in the bundle (or any other Saranghae products for that matter), and Saranghae never tests on animals. The company is registered with PETA. What about the plant-derived ingredients used in Saranghae products? These are fully organic and are harvested through sustainable agricultural practices. To use the 5 Step Bundle, you need to apply each of the Saranghae products I have outlined above in the order I presented them in. Do the first 4 steps once in the morning and once in the evening. Apply 3-4 pumps to your face. Use your hands to rub in the cleanser. After about 15 seconds, gently apply a little lukewarm water onto your face. This will cause the cleanser to foam. After that, just rinse it off. Rub 2-4 pumps into your face. Then pat your skin gently. Do not move onto Step 3 until you have waited at least 10 seconds. Squeeze a small amount of cream out and rub it into your face and neck. As with the previous step, pat your skin and wait 10 seconds. Squeeze out 1-2 pumps of the eye cream and rub it into the skin around your eyes. Make sure you do not put it on your eyelids. Pat it a bit, and wait another 10 seconds before the last step. Just do this step once or twice a week. Start by cleansing your skin, and then wear the mask for 15-20 minutes. Make sure you follow all the instructions you receive with the products carefully. Be consistent. Do not skip morning or nightly applications. You will get the best results on the expected timeframe if you stick with it. If you are having issues, you can try applying to damp skin (I find this works better with moisturizers, even though it isn’t what the directions say you should do with Saranghae). It took me a couple of weeks of debating with myself before I took the plunge and bought the Saranghae Complete 5 Step Bundle. I am usually willing to spend a little extra for top-shelf skincare, but it was a big purchase and I wanted to be sure. 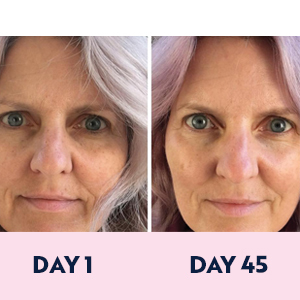 I didn’t notice any obvious difference after my first application, but I have a lot of experience with skincare, and I knew it is important to be patient. After the third day of using the bundle, I noticed that some of the dry patches on my face were less pronounced. My complexion also started to feel a bit smoother and softer. By the second week, the dry patches were gone entirely, and my fine lines were less noticeable. By that point, I was certain I had made the right decision. After a month, what really knocked my socks off was when I noticed that some of my discolored patches (from years of too much sun explore) were lighter! In fact, by day 30, I had already achieved the results I hoped to get by day 45. When the improvements continued over the next two weeks, I was even more impressed. Needless to say, I’d already ordered my next kit. Any hassles? I did have a breakout at one point, but switching things up a bit with the routine (namely applying to damp skin) took care of it. Oh, and did I mention I have gotten some awesome compliments? My husband told me my skin has a real glow to it now, and one of my co-workers asked me where I’d gotten my facial. Don’t wait another day for age to keep taking its toll on your skin. The time to stop the clock is now, and the Saranghae Complete 5 Step Bundle is the answer you’ve been after. I have had incredible results with this product. I can’t remember the last time my skin was this soft, silky, smooth and clear. Give it a try and you’ll soon be looking at a fresher, more youthful face in the mirror!